The following information will help you truly understand the differences between the design of the Revolution vs the AR10 platform. The Revolution is an AR15 that is engineered to shoot the .308/7.62×51 cartridge. We started with the footprint of the M16 and added the overmatch force multiplying punch of the .308/7.62×51 battle rifle. The M16 is the shortest. The .308 Revolution & AR10 at the same length. M16/Revolution (both use the same charging handle). It is the shortest charging handle. .308 Revolution. Same size as the M16. This is the smallest bolt carrier used in these platforms. “Intermediate Frame” AR10 – Has the same length & body diameter as the AR10 bolt. Only the locking lugs are Intermediate in size. .308 Revolution – Same size as the M16. The shortest length, smallest body diameter, and the smallest locking lug diameter. Only the geometry changes to allow the .308 battle rifle cartridge to shoot in the Small action Frame of the Revolution. AR10 – The longest in length and largest body diameter for the Large action Frame. The head diameters are the same diameter as all frame/action sizes. “Intermediate Frame” AR10 – Intermediate in length and body diameter. The head of the cam pin diameter is the same as the others. .308 Revolution – The shortest length and smallest body diameter of all and built for the small action/frame. The head diameters are all the diameter of the M16/7.62 Revolution. AR10 – Largest in diameter but shorter in length when compared to the “Intermediate Frame” AR10. “Intermediate Frame” AR10 – Barrel extension is the longest in length but the diameter is a 1/16″ larger than the M16 barrel extension. .308 Revolution – Same length and diameter as the M16 barrel extension. Only the feed ramps are changed to handle the large .308/7.62×51 cartridge. Built to fit in our Small action/Frame. M16 – Smallest length and diameter barrel extension built for the small action/frame to shoot the .223 / 5.56×45 ammo. 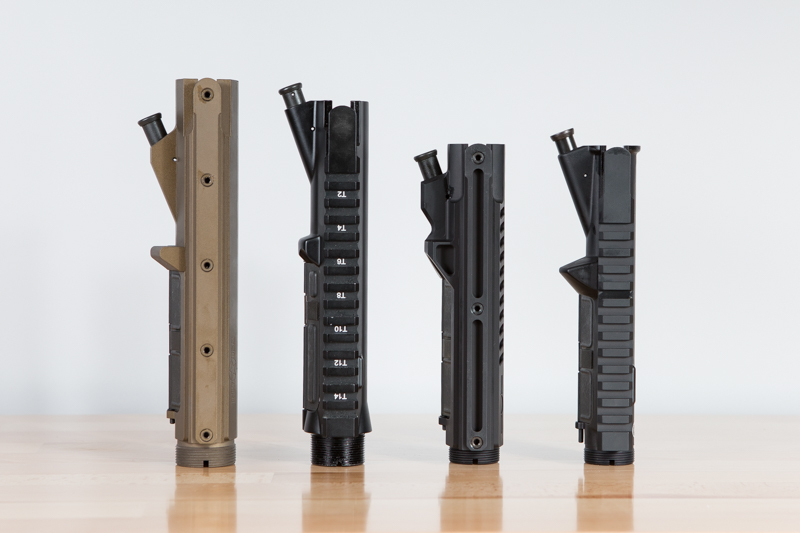 The Upper Receivers length shown in the picture shows the differences in length. AR10 – The longest in overall length but has a shorter thread length of the barrel nut compared to the .308 Revolution. “Intermediate Frame” AR10 – About a 1/2″ shorter in overall receiver length to the AR10 but has the longest thread length of barrel nut of all upper receivers. M16 – Small action/frame built to shoot the .223/5.56×45 ammo. As you can see, the proof is in the pictures. We’ve attempted and succeeded at bringing true innovation to this platform. The .308 Revolution uses many of the same interchangeable parts, or redesigned parts that are similar in size to those belonging in an AR15. This results in the footprint and overall length of the Revolution to be the same size and weight as your AR15. This is truly an AR15 designed to shoot the .308 cartridge! Fits in an AR15 carbine sized pelican case as well (IM3100 Storm Case)! So, when does the 6.5 Creedmoor “Revelation” variant release? Feel free to use the name! Still can’t run a RDIAS in one… so it is not completely accurate to say that this is an AR that shoots .308. The COLT LE901 will accept a RDIAS. You could have added that most of the 6.5mm family of calibers will run in this chassis as well (although anyone who appreciates this article should already understand this). I believe the first picture in the group depicting the Barrel Extension is in reverse order, the AR10 is on the right. The reported order of left to right is correct on all of the other photos. An interesting exercise, I’m curious to see this Revolution in action (excuse the pun). > Thanks for the catch! I am curious to ask if the Revolution is only piston, direct impingement, or is it available in either platform. Also the only difference in my understanding on the lower, in it and an AR15 is the size of the mag well to accommodate the larger cartridge, or are they the same size, length and width, is that correct? All other capabilities of the interchanging of trigger and hammer mechanisms are the same as the AR15, is this correct? Another question is that the pin locations on the lower, are they in exactly the same positions and size as a regular AR15, and is the only difference in the bolt carrier group the chamber end in which it grabs the larger casing of a 7.62×51, otherwise it is exactly the same as an M16 bolt carrier group? I have watched the instructional video of the differences, but wanted to make exactly clear what some of the specifics are. If there is a number to technical support please leave it in your response, so that I can possibly speak to someone before I decide to order one. THANK YOU. The Revolution is piston only at this time. There may be a DI one in the future, but there is nothing planned for this year for it. The lower receiver on the Revolution is the same length and width as an AR-15 lower receiver. Lengthening the magazine well to the length of an LR-308 magazine well caused us to have to push the trigger well and pistol grip further back into the body of the lower and lengthen the firing pin to re-align the system. We use the same trigger in the Revolution as in the P-415 and it has the same hammer/trigger pin dimensions and relative locations as any AR-15, just further back in the body of the lower. The bolt carrier is the same one as in our P415 with a special bolt and firing pin, the charging handle is the same Tomahawk used in our Renegade+, and the bolt face exterior dimensions have been modified to fit the .308 cartridge yet still fit inside a 5.56 sized barrel extension. We were only able to do this with a thin wall on the bolt face, and by utilizing a horrendously expensive alloy that is 50 times the surface hardness of Mil-Spec carpenter steel used in standard AR-15 bolts, and has a much higher temperature and pressure tolerance. > I’m glad you mentioned the alloy used for the bolt face, as that is absolutely critical to the capability, and the longevity of the BCG. I would, however, like to know what SAAMI specifications you’ve achieved on the barrel, and any non-proprietary information that you can share regarding it’s alloy composition, and is it CHF? Do you foresee any barrel length choices for the .308 in the future? 1: We have too much money and R&D time invested into the alloy composition in the Revolution bolt to release any specific technical information on it. It is our policy to not release specific information on it so as to protect that investment for as long as possible. 2: The chamber tolerances on the Revolution are within .0004 +/- .0001 of perfect SAAMI spec when brand new. This leads to un-paralleled accuracy within the platform on par with a premium bolt action rifle, but also absolutely requires a minimum quality of ammunition to at least be loaded and cut to a reasonable match to SAAMI spec. We recommend using American made factory loaded ammunition with the rifle to ensure flawless operation. 3: We have started rolling out the 18.5” Revolutions through the distributor RSR, your local POF dealer is able to order them through them in either Black or Burnt Bronze. Otherwise, we offer 12.5” SBR/Pistol Revolutions, 14.5” Pinned/welded and the original 16.5” barrel options. There are no other barrel sizes planned at this time for the Revolution. Also, We do not CHF our barrels. In our thorough testing, we have decided that we get better results with 5R button rifling our 4150 Chrome Moly barrel blanks in a polygonal rifled pattern, where the improved hugging and contact with the projectile reduces copper fouling and dramatically increases comparative muzzle velocity. We then finish our barrels with a Nitride Heat Treatment to dramatically improve barrel life and heat resilience over chrome lining or phosphating. Will you be releasing the barrel extensions and stripped uppers as stand alone parts for those who want to build a custom upper? I think it would be awesome to fit an 18-22″ 6.5 Creedmoor barrel from either Proof or Dracos. That would give a true lightweight long range semi-auto platform, arguably the only one on the market. On the subject of long range shooting, it would also be nice to have an “off” position on the gas block for saving brass and working the rifle like a bolt gun. One final question… am I reading correctly that you could use any AR15 Bolt Carrier as long as you add your bolt, firing pin, and cam pin? At this moment, the Revolution will only be sold as a complete rifle. Seems like a lot of BS to go through when you could just get a HK 91 instead!!!! There are many states that are now considering more restrictive gun laws this fall, mine being one of them. I would gladly purchase a rifle at $2,500 if I could. However, I have a limited budget and little time to scrape together the funds needed before November and a potential ban on this rifle. Many gun enthusiasts are in a similar situation and would like the opportunity to build their own using your receivers as a platform. Wouldn’t selling parts and kits also help the POF Revolution become the standard in .308? The .308 market is so fractured as it is with so many specs and different companies making their own special contour of rifle, it is highly unlikely that would be possible to put the genie back in the bottle and have the market rally around a singular specification. Plus, if every manufacturer had a Revolution style rifle, it wouldn’t take long before cost cutters began selling cheap versions and killing people’s confidence in the idea of an AR-15 sized .308 rifle. Several of the more expensive alloy picks and things that drive the cost of the rifle up are non-negotiable if you want the rifle to be every bit as relentlessly reliable as the rest of our lineup, and cutting costs to drive cost down is NOT advisable with this platform. I can certainly understand frustrations with gun laws changing, and without the will or ability to move and “vote with one’s feet”, and being stuck in a certain place, it can make it more difficult to acquire rifles into the future should there be law changes. We will always do our best to offer compliant versions of our rifles wherever possible. With the market the way it is, and with the market the way it will be for the foreseeable future, we would open up the world’s worst can of worms if we tried selling the Revolution as anything but a complete rifle. I traded a H&K 91 with lots of accessories (PSG1 trigger, 22 LR conversation, etc) plus another rifle to get a revolution. I hope to pick it up this week. I will comment once I have some range time with the rifle. I am always interested in robust and reliable accurate rifles. A recent review in American Rifleman was very favorable. Accuracy was called out as commendable, and comparable to an expensive bolt action rifle. During your factory testing, have you determined the thermal capability of this riflel? Some lightweight, thin hunting rifle barrels heat up after 3 rounds and start to lose accuracy. How many rounds can this rifle fire before accuracy fades? By that, say 5 round groups open up to 3″ @ 100yds. Please state in terms of: 30 rounds in 60 seconds or similar criteria: # of rounds in a unit of time. Thank you & I’ll check back for your reply or please send email. In our most recent testing on the Revolution rifle, we would run 20 rounds (1 mag) at 1 round per second and then perform an accuracy test immediately after. This would include a 5 shot group at 200 yards. The results showed that the rifle still shot MOA but the POI would shift about 1 inch high. This test was performed at about 70°F. Naturally, these results would be affected by ammunition choices, ambient temperature and pressure differences but it shows that the system is remarkably robust and able to handle itself well against heat buildup. I only want to purchase one rifle. I want to punch one ragged hole. Given all of your options is there a great difference at 600 yds between your Revolution 16.5 and 18.5 barrels? I have to ask when will there be a .458 Socom? When will NP3 color be available to purchase in California? Anything that can be ordered NP3 in the regular lineup can be ordered NP3 in CA featureless. Hello , I want tell you POF, I just got my POF REVOLUTION AR15. 308 RIFLE few months ago. Test fired it at range. This is an update from my first comments made April 30, 2018. I was very excited to get my hands on the Revolution. As soon as the dealer called and told me it was in I picked it up that day. Examining the rifle as it came from the box I was very impressed with the quality. I fitted the rifle with a Steiner 1 X 5 X 24 military scope with a Burris P.E.P.R mount that evening. The next day I shot 40 rounds of 7.56 Nato 10 rounds of Federal 168 gn. match and 10 rounds of Remington 165 gn. Nosler Ballistic tip. The rifle was not accurate. 6″ groups were the norm. The best I could get was 4″ groups from the match ammo. I called POF and spoke to Will. He asked me to try about 100 more rounds through the gun and explained that some guns “Shoot in” and get better with about 200 rounds through them. I changed out the 1 X 5 scope and put on a 3 X 15 X 44. The next day I shot about 60 more rounds with the same results. I call Will back and reported the lack of improvement. He asked me to return the rifle. $65.00 later for shipping and insurance the rifle was on its way back to POF. Two days later , May 23rd. the rifle was received and I got an email letting me know it had made the trip. Due to POF’s gunsmith being out of the factory and POF closing to celebrate the Fourth of July it took until August 7th for POF to replace the barrel and the bolt and ship the rifle back. Fedex took over a week to get the rifle back to me. I have had a chance to spend two days with the rifle at the range and after 200 rounds of ammo I am pleased to report that the rifle now shoots. With the 1 X 5 scope I can shoot consistently 1.5″ or less groups with most ammo, and every now and then I get groups that are less than an inch. Not bad considering that my aiming dot covers 2″ at 100 yards. I said all of the above to say this. No one gets it right all the time, but it is how you handle the problems that is important. I want to thank Will at POF for keeping me informed and fixing the problem that my rifle had. I felt that POF did what needed to be done to bring my rifle up to the high standard that POF has set. Will apologized for the problem and thanked me for my patience. I told him that if this issue is the worst thing that happens to me then I have lived a blessed life. POF stands behind their products! Awesome ! Cant wait to fire it. Back in 2006 I launched 308ar.com and it’s forum to help shooters understand that all .308 AR’s are NOT AR-10’s and it’s been a battle educating shooters, manufacturers and vendors alike. I must say you folks nailed it with this page and accurate responses. I did smile a bit though because I have spent quite a bit of time publicly stating that there is no such thing as a “.308 AR 15”. I must say you folks are pretty darn close and close enough that my responses will now include an *asterisk about the POF Revolution. Great bit of engineering here. Good luck with the platform!